Get your jobs done fast. 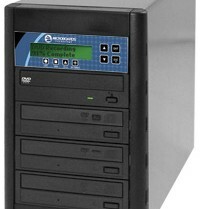 All CopyWriter systems feature 48X CD-R / 24X DVD-R/+R recorders. Systems come configured with combo CD/DVD burners or CD-only burners. The intuitive 8-button panel and multi-line display make copying discs a simple procedure for the novice user, while keeping all the high-end, power-user features in tact, like disc verification mode and adjustable recording speeds. Upgrade to the Pro Series for a premium tower with 500GB dynamic hard drive for storage of disc images, making it easy for you to create copies on the fly! Since the very beginning, Microboards has strived for excellence. Being the original producers of the tower duplicators, Microboards Technology understands the importance of super reliable technologies that deliver what you want, when you want. This page was updated Thursday, October 22, 2009 at 8:55am by Microboards Marketing Department.